French tosafist; died 1198. He was a pupil of R. Tam, and is often quoted in tosafot—sometimes as "RAM," sometimes as "R. Eleazar." He wrote commentaries on Nedarim, Berakot, and Ḥullin, the last two of which Azulai saw in manuscript. His commentary is probably referred to in the Tosafot to Nedarim, where "Eleazar" is frequently quoted. 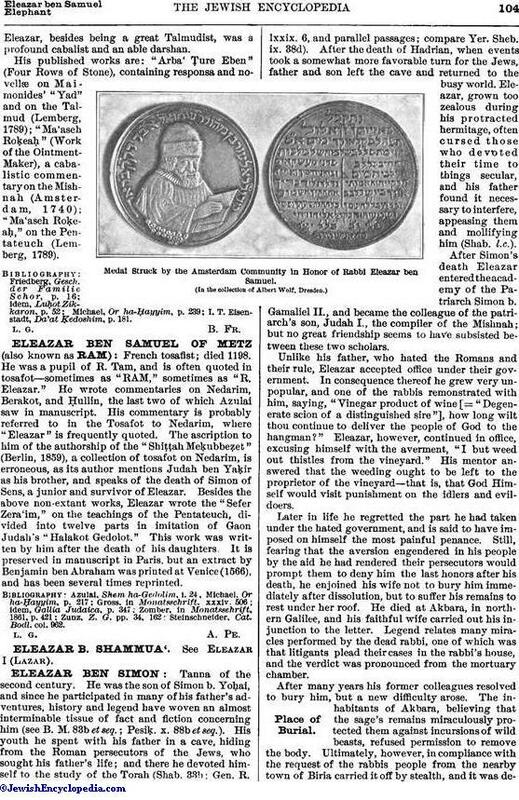 The ascription to him of the authorship of the "Shiṭṭah Meḳubbeẓet" (Berlin, 1859), a collection of tosafot on Nedarim, is erroneous, as its author mentions Judah ben Yaḳir as his brother, and speaks of the death of Simon of Sens, a junior and survivor of Eleazar. Besides the above non-extant works, Eleazar wrote the "Sefer Zera'im," on the teachings of the Pentateuch, divided into twelve parts in imitation of Gaon Judah's "Halakot Gedolot." This work was written by him after the death of his daughters. It is preserved in manuscript in Paris, but an extract by Benjamin ben Abraham was printed at Venice (1566), and has been several times reprinted. Steinschneider, Cat. Bodl. col. 962.